On Saturday 8 September, Kagyu Dechen Dzong welcomed Lama Jampa Thaye for this year’s Autumn visit to Yorkshire. 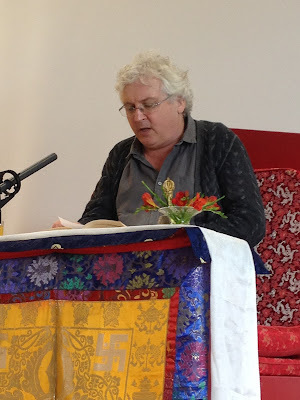 On this occasion, Lama Jampa completed his teaching of Jamgon Kongtrul’s ‘Doha of Mahamudra’, which he commenced earlier in the year, and bestowed the Initiation of Manjusri Lion speech from the lineage of Dampa Sanjay. Afterwards, Lama Jampa noted the extraordinary debt which we owe to Jamgon Kongtrul. As one of our most recent fore-fathers in the ‘golden garland’ of lineage holders of the Dakpo Kagyu, Jampgon Kongtrul saved from extinction a great body of precious textual works and practices. Many of these now form part of our own shedra curriculum. Lama Jampa then urged those present to read Jamgon Kongtrul’s biography (now available in translation) and alluded particularly to the many obstacles the great master surmounted during his lifetime, which we should take to heart as a source of encouragement in our own lives. Finally, Lama Jampa surveyed the extraordinary events of 2012, including the landmark visit of His Holiness Karmapa to Yorkshire for the first time.